Please do not send in your valuation document/diamond certificate that you might have received with your ring, just the form and the ring itself is all we need. If you have the box, or another box that will securely hold the ring, please include this if possible. Please note that items that have been delivered to you and then sent back to be re-sized, will not subsequently be accepted for a refund. Please see our Terms & Conditions before sending any items to us for resizing. How long do I have to return my ring for resizing? We will happily resize your ring for you at any time, whether it is within the first few weeks are your receive it, or many years down the line. Where do I send my ring to? Resizing usually takes 3-5 working days, however, this will vary depending on the ring itself and how much work is required. How much does resizing cost? Please note this includes the cost of us posting the ring back to you via Special Delivery, but you need to cover the cost of sending the item to us. Please use Royal Mail Special Delivery of a tracked/insured courier service (our address and further details are on the form). How do I pay for the resize? Cheque made payable to Purely Diamonds. Debit or credit card over the phone. Make a bank transfer to account number 51722670, sort code 40-09-25, with your full name as the reference. Will my ring need to be re-engraved and does this cost extra? Unfortunately, it is impossible to size a ring up or down without removing the engraving. Please use the resizing form provided to request the engraving be done again after sizing. Please be aware there will be an additional charge of £20.00 for this on top of the resize charge (if applicable). Does resizing alter/change the quality of the ring in any way? Please be assured your ring will be returned to you exactly as you received it. There will be no visible markings or changes to it and the quality will not be affected. Resizing is a very common procedure and does not damage your ring. 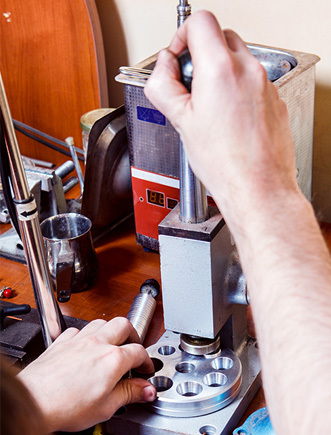 If you need your ring resized by a large amount up or down, we might need to remake the ring instead, but we won't charge you for this process but it would mean a longer timescale for return of your ring (usually 2 weeks). Full eternity rings cannot usually be resized as the stones go all the way around the ring, so in this case we would remake the ring and this would take 2-3 weeks. Will resizing the ring loosen the diamonds? Diamonds can become loose during the sizing process, but all stones will be checked thoroughly before the item is sent back to you and of course tightened where necessary to ensure all stones are secure. How is a ring made larger/smaller? Increasing the size of a ring can be done in two ways. When a ring needs to be made just slightly larger, it can simply be stretched/rolled to the desired size. If need be, extra metal can also be added to the ring with fine jewellery workmanship to ensure no joins are visible. Decreasing the size of a ring requires cutting the band, re-shaping it and lasering or soldering it back together. It is then finished and polished in such a way that no indication of the sizing is visible. We can assure you these are all very common procedures and every care is taken to ensure your ring is not affected by the re-sizing process. Any parcel sent back to us (which must be sent always via Royal Mail Special Delivery or a similar tracked and insured courier), needs to be insured/covered for the price of the item during transit. For example, if your ring cost £800 to purchase from us, you must cover it during transit for at least £800. Royal Mail offer insurance coverage at 3 different price levels - up to £500, up to £1000 and up to £2500 (their maximum value). If your ring cost more than £2,500, please insure it for the maximum. We have our own insurance which then offers you coverage of an extra £2,500, meaning overall maximum insurance of £5,000. If your ring cost over £5,000, please call or email us to discuss your options. The price of your ring is the price you paid to us, not the higher amount that will be shown on your valuation document. You do not need to cover your ring for this higher value, only for the amount you paid to Purely Diamonds.